Defense Ministry Considering New Ranks? An old story worthy of a slow Orthodox Christmas Day…. In mid-October, an unnamed source told Interfaks that the Russian military might introduce a new rank–either ‘brigade general’ or ‘senior colonel’–in between its colonel (O-6) and general officer ranks. The story called forth a variety of official and semi-official reactions. According to one account, the Defense Ministry termed discussion of a new rank “premature.” Other accounts said no decision on the introduction of a new rank had been made. Others dismissed the story as pure rumor, saying the issue was not being worked in the Genshtab or Main Personnel Directorate. One Genshtab source attributed the story to the imagination of journalists. The Interfaks source said the Defense Ministry might confer a new rank on the commanders of its 85 new permanently ready Ground Troops brigades and 33 air bases. The new rank would supposedly “enhance their status,” and distinguish them from “ordinary” colonels. However, in late November, State-Secretary and Deputy Defense Minister Nikolay Pankov said the issue of new ranks was speculation, and had not even been raised. He said the current rank structure would remain, and denied that either ‘brigade general’ or ‘senior colonel’ would be introduced. Who knows whether a new higher rank would be significant to Russian officers? One new brigade commander said that, when you’re living month to month, higher pay is the best incentive and recognition. The best commanders are already being ‘incentivized’ with Serdyukov’s premium pay. But, in a couple years, all officers are supposed to share in a new and significantly higher base pay scheme. Several well-known defense commentators like the idea of a new rank to distinguish the new brigade commanders. Anatoliy Tsyganok says he is more concerned about whether they will receive the education and training needed to become operational and operational-strategic commanders at a time of wholesale changes in the Russian military educational system. ‘Brigade general’ or brigadier would fit well into the current Russian system, since a Russian one-star is a General-Major. Moscow reportedly would not go with ‘senior colonel’ because it might look like Russia was following the lead of China, North Korea, and Vietnam. If this issue comes back around, it’s worth remembering how Pankov flatly denied it. 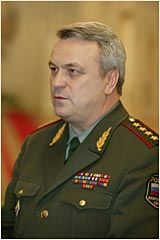 This entry was posted in Command and Control, Serdyukov's Reforms and tagged Anatoliy Tsyganok, Genshtab, Main Personnel Directorate, Nikolay Pankov. Bookmark the permalink.